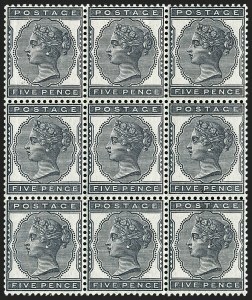 VERY FINE AND PARTICULARLY EYE-APPEALING MULTIPLE OF THE 5-PENCE INDIGO. NOTABLY RARE IN A BLOCK THIS SIZE. Ex Baillie. 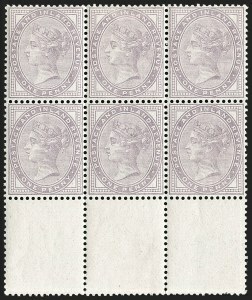 SG as hinged block of four and five singles £7,875. VERY FINE. A STRIKING AND UNIQUE PAIR OF MATCHED CONTROL SELVAGE BLOCKS OF SIX WITH DOUBLE ERROR -- PRINTED ON BOTH SIDES AND WATERMARK INVERTED. EXTREMELY FINE. 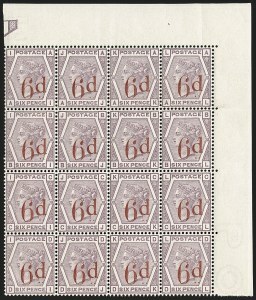 A PRISTINE AND STRIKING BLOCK OF THE 6-PENCE UNIFIED ISSUE SURCHARGE. Trials of these surcharges were originally done on the 1p Inland Revenue in black. It was decided that Black clashed with cancels too closely and Carmine was chosen. 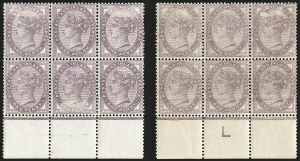 Sheets of 3p, 6p and 1sh sheets from existing stock were chosen to be overprinted. Due to an objection from the Telegraph Branch, the 1sh was pulled from production. Sheets of the surcharged 3p and 6p were broken into blocks of 40 before sale. SG as four hinged blocks £13,600. VERY FINE. 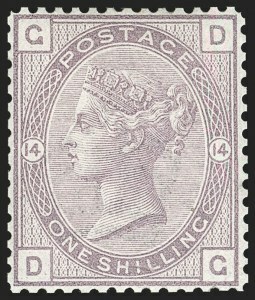 A SUPERB EXAMPLE OF THE UNISSUED ONE-SHILLING PURPLE, PLATE 14 WITH LINE PERF 14. OF THE 36 IMPRIMATURS ORIGINALLY PERFORATED, LESS THAN HALF OF THOSE ARE THOUGHT TO EXIST TODAY, ALL ORIGINATING FROM THE STAMP COMMITTEE PRESENTATION BOOKS. Only 36 copies of the "Before and After the Stamp Committee" presentation books were given as gifts to officials, including Queen Victoria (it is now part of the Royal Collection with 1sh Purple separated). All known examples of the 1sh Purple originate from these books, although not all 36 books contained one. Some contained the 1sh Orange Brown instead, and it is believed that fewer than half of the books contained the 1sh Purple. Remarkably, the Bertsimas collection also features a complete presentation book with the 1sh Purple (see lot 3092). 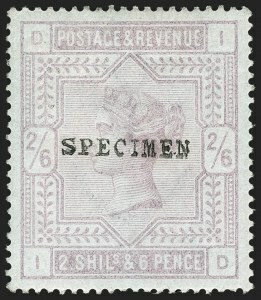 This issue was supposed to be surcharged 1sh, similar to the 3p and 6p (SG 159, 162). There was a great need for stamps for telegraph purposes, but the final product never came to fruition and production was stopped midway. De La Rue supplied the stamps quickly, taking the registration sheets for the creation of the presentation books. As they were received imperforate, they had to be hurriedly perforated to look like issued stamps for inclusion in those books. Ex Baillie. With 2005 B.P.A. certificate. SG £15,000. EXTREMELY FINE. 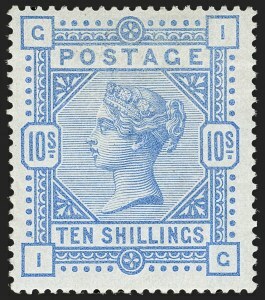 A CHOICE EXAMPLE OF THE SCARCE 2-SHILLING 6-PENCE ON BLUED PAPER. 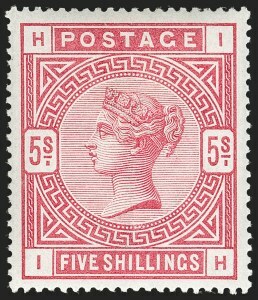 This value was adopted to serve postal duty and to replace the 2sh6p Inland Revenue embossed stamp, hence the "Postage & Revenue" legend. No essays were created for this value, as it was hastily executed by adapting a 3sh essay. 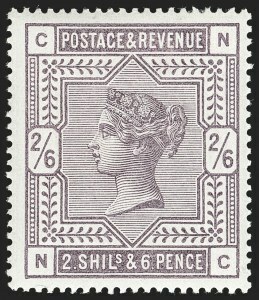 It shows the tightly spaced wording, and the "2/6" looks more like a fraction than a shilling value. Ex Gross. With 1990 R.P.S. certificate. SG £6,750. Scott $9,250.00. VERY FINE EXAMPLE OF THE 2-SHILLING 6-PENCE ON BLUED PAPER DURING THE WHITE PAPER PERIOD. AN UNUSUAL AND RARE VARIETY. 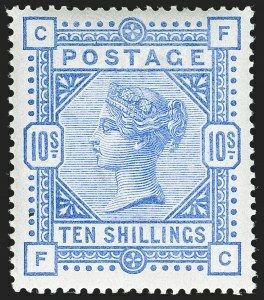 The Blued paper is often referred to as "Revenue" paper, as it was chemically treated to prevent reuse of pen-cancelled revenue stamps. It is generally assumed that the 1883 Issue was first printed on this paper to use up the stock on hand, since high denomination stamps were not pen-cancelled, thus eliminating the specific need for it. The question of why this particular blued paper stock was used during the white paper period is still up for debate. The only logical conclusion put forth by Wiseman is that due to the lack of stock controls at Somerset House, some old stock could have been previously overlooked and used for the 1884 printing. Ex Baillie. With 1975 R.P.S. certificate. SG £9,000. EXTREMELY FINE. 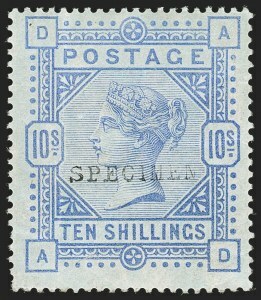 A SPECTACULAR EXAMPLE OF THIS RARE 5-SHILLING ROSE ON BLUED PAPER, ESPECIALLY SO IN THIS PRISTINE CONDITION. 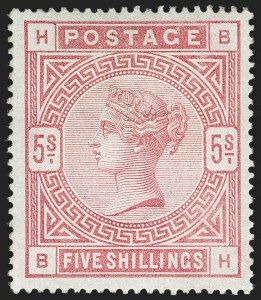 Despite its high catalogue value, examples of this stamp are available on the market. However, what should not be overlooked is the condition of almost all examples offered for sale. Most are slightly off center, regummed, repaired and/or have surface rubbing. Examples with none of those problems are rare, and the stamp offered here is one of the finest extant. VERY FINE. 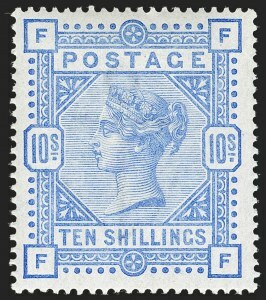 AN IMMENSELY RARE EXAMPLE OF THE 10-SHILLING ULTRAMARINE ON BLUED PAPER. A MAJOR GREAT BRITAIN RARITY, ESPECIALLY SO IN THIS CHOICE CONDITION. The color of this issue, unlike the 5sh, was undecided for many months. The De La Rue First Scheme was in Brown, Second Scheme in Red and Third Scheme in Brown again. It was not until the Fourth Scheme submitted on Dec. 12, 1882, that the Ultramarine color was selected. 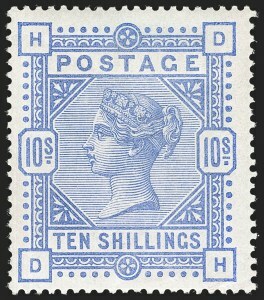 VERY FINE EXAMPLE OF THE 1884 10-SHILLING COBALT. EASILY ONE OF THE FINEST EXAMPLES OF THE SMALL HANDFUL KNOWN OF THIS SUBTLE BUT DISTINCTIVE SHADE. Wiseman's theory that this shade resulted from chemical treatment of the paper is conjectural. Without adequate studies, it is still debatable whether this shade is a chemical changeling or the result of different pigments used in printing. Specialists agree that this shade differs from Ultramarine and is truly rare. The impressive condition of this stamp mandated a small comment on the R.P.S. certificate as "Memo: A fine stamp". While seemingly innocuous, notations of the general quality of stamps are rarely seen on certificates unless truly warranted and out of the norm. Ex Baillie. With 1990 R.P.S. certificate. SG £42,000. Scott $40,000.00. VERY FINE. A CHOICE EXAMPLE OF THE DESIRABLE 1884 ONE-POUND WITH WATERMARK CROWNS. PARTICULARLY ELUSIVE IN THIS QUALITY CONDITION WITH ORIGINAL-GUM. Ex Gross. With 1981 B.P.A. certificate. SG £32,000. Scott $32,500.00. 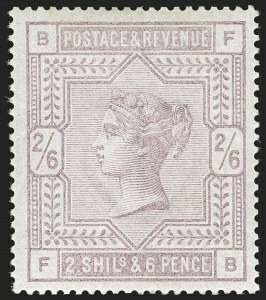 VERY FINE AND CHOICE EXAMPLE OF THE ONE-POUND BROWN LILAC ON WATERMARK ORBS PAPER. ONE OF THE FINEST EXAMPLES IN EXISTENCE, BOASTING SUPERB OVERALL FRESHNESS. AN ICONIC GREAT BRITAIN RARITY. A little known fact about the £1 on Watermark Orbs paper is that this issue was printed in error. Wiseman explains in detail that on Nov. 5, 1887, a Warrant was issued calling for the stamps to be printed. The word "Orbs" was accidentally written instead of "Crowns". The error was noticed well before the supply was exhausted, but the Orbs stock was issued nonetheless. 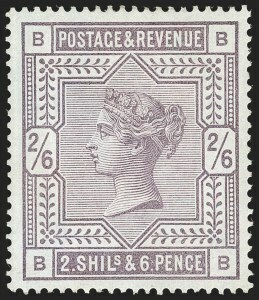 Owing to the long size of this stamp, examples invariably have faults such as creases and bends. Many unused examples have also been regummed. An example free of faults with original gum is a great rarity. Ex Baillie. Signed A. Diena and Mondolfo. With 1978 B.P.A. certificate. SG £72,000. Scott $75,000.00. VERY FINE. 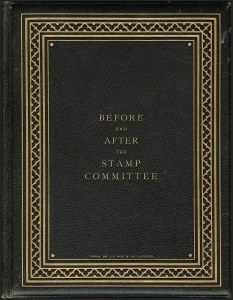 ONE OF THE FEW INTACT STAMP COMMITTEE PRESENTATION BOOKS SURVIVING FROM THE ORIGINAL 36 GIVEN TO OFFICIALS AND DIGNITARIES, MOST OF WHICH DID NOT INCLUDE THE 9-PENCE STRAW AND ONE-SHILLING PURPLE. Only 36 copies of the "Before and After the Stamp Committee" presentation books were given as gifts to officials, including Queen Victoria (it is now part of the Royal Collection with 1sh Purple separated). All known examples of the 1sh Purple originate from these books, although not all 36 books contained one. Some contained the 1sh Orange Brown instead, and it is believed that fewer than half of the books contained the 1sh Purple. 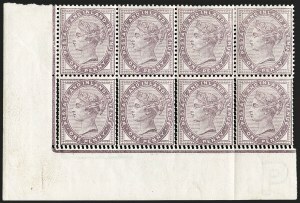 Remarkably, the Bertsimas collection also features a single of the 1sh Purple (see lot 3077). Original reports indicated that only six of the presentation books contained the 1sh Purple, but there were probably more. Due to collector demand for singles, many of the pages have been destroyed with the key values removed. Very few complete presentation books with the 9p Straw and 1sh Purple still exist.